I guess I should begin with an apology for the photograph I have chosen to begin the article with, it the Hi-Vis Royal Worm and yes it floats and I have caught trout on it. However on second thought I won't apologize as fly fishing is suppose to be fun and if you can't smile at this photo which would have shocked Mr. Halford then you need to get a sense of humor and quit taking fly fishing so seriously! In 1886 Frederic M. Halford published Floating Flies and How to Dress Them and this was followed by Dry Fly Fishing in Theory and Practice in 1889 and these two volumes would change the face of fly fishing all over the world in the most dramatic fashion. Due to the popularity of the dry fly and the dominance of Halford some of the effects on the world of fly fishing was good and some was bad. First we will wander back through the pages of history and take a look at the origins of the dry or floating fly and the progression of the dry fly up to the publication of Halford's works. When I travel the pages of history I am seeking knowledge and the truth and therefore when I read the words of the ancient anglers I am trying to do so with an eye for the times that those words were written, trying my best not interject modern times into the words I am reading. Therefore I try to report the facts as I find them or to tell the reader where they can find the text and read them and make their own determinations. The story of the dry fly begins in 200 A.D. with the writings of Claudius Aelianus now there are historians who will argue that the fly was tied with wool and therefore a wet fly. However, wool of the time period was infused with lanolin which is a natural floatant, also note the text describes the angler seeing the speckled fish glide up and eat the winged insect off the surface of the water, in conclusion why would any attempt to create a wet fly when it was a dry fly that the speckled fish was eating. Yes, we who peruse history are bound by the written word, however we are suppose to think and be logical, offering words and research to better understand the recorded events. Sadly, historian's often use history to push their point of view, much like I am now doing. Even I can see the humor in this narrative! Some historian have reported on the Macedonia event and then jettisoned the event as something that had no natural progression to tie to the fly fishing literature that began to appear in 1496. To me this is an oddity that is hard to ignore and history does indeed offer and explanation. First you have to remember how books were published and that was copied by hand as the Gutenberg Press wasn't invented and in use until 1450. Then you must look at the literacy rate from 200 A.D. and 1496 and then look at the general history of the time. This time period includes the fall of the Roman Empire, wars and the Dark Ages and all that went on during the time period in question. The historical fact is that during the invasions and wars libraries were often targeted and burned by the invaders and scholars were often killed. This coupled with Dark Ages, the plague and the literacy rate it's small wonder that any written word survived this time period. There are fine historians who are diligently searching for and finding texts and information on this time period and slowly completing the picture that is the history of fly fishing, however that is for the future we will now return to following the progress of the floating fly. The first major literary landmark was the publication of The Boke of St. Albans in 1496 which was edited by Wynkyn de Worde and contained A Treatyse of Fysshynge Wyth An Angle authored by Dame Juliana Berners. In the Treatyse twelve fly patterns were suggested and though Berners offered no words on if the flies were dry or wet or whether or not they were to be fished upstream or down- stream. However all twelve of the patterns were tied with wool and a research of how wool was handle leads me to believe that the wool of time would still be infused with lanolin which is a natural floatant. Now after reading most of the old texts that I was able to have in my library or access on the internet from many different sources I believe that the use of the floating fly and progression of the wet fly traveled the course of history almost side by side. Before I go forward with this dissertation I would like offer a comment on the writings of the early authors. Many of their books contain information on all types of fishing to include bait fishing and if you think about the time and place that these early text were written it actually makes sense, those authors were covering all of the bases as early on there was not the interest in fly fishing to sustain publication devoted to just one subject. However as the interest in fly fishing grew there would become enough fly anglers to support publications dedicated to the one single topic of fly fishing. Also many historian and authors make a point of underlining passages which were copied from previous authors, today plagiarism is considered a serious offence, however the modern stigma of plagiarism didn't surface and become accepted until the 18th Century. During the time period of the 15th, 16th and 17th century plagiarism was look on much differently and those who prowl the pages of history should been aware of this fact! After the Treatyse the next text we will look at is that of Leonard Mascall who published A Boke of Fishing with Hook & Line in 1590. In his book he states that "Flies are to be used on the top of the water." To me that is a pretty clear statement that floating flies were being used. In 1662 Robert Venables published The Experienced Angler and within the pages of this book you will find mention of casting flies upstream to feeding trout and references that flies are fished on the top of the water and beneath the surface. In 1676 Izaak Walton published his 5th Edition of The Compleat Angler and part two of this volume was authored by Charles Cotton with his Instructions how to Angle for a Trout or Grayling in a Clear Stream this is another landmark publication and contain information on fishing both upstream and downstream according to dictates of the wind. Text is written in an interesting and is somewhat hard to get through, however I believe that Cotton fished flies both on the surface and beneath of surface. As a side note the third section of book was that same work published by Robert Venables, also this last the last edition published in the lifetime of Walton. There were many authors to follow that often mentioned fishing fly on the top of the water and who recommended that at times the angler should cast upstream to the trout. Consider this, the ancient angler observed trout taking insects off the surface of the water, regardless of the tackle of the day, does anyone actually believe that they would have ignored this action and only fished wet flies! Of course not, they would explore every option to present their creation to the surface of the water. Now some have tried to place definitions on what is a dry fly and what constitutes dry fly fishing. This is again an absurd idea for historian to assign designation and definitions to events that began long before they were ever born. But regardless of these silly definitions, it the intent of the presentation was to place the imitation on the surface to the feeding trout then in my opinion it is a dry fly! I will add another point of interest for you to consider, many angler did fish wet fly because they found them to be effective and possibly they didn't want to place the extra effort I took to fish the floating flies. As time progressed so did the fly tackle and gone were the days of super long rods and single handed light weight rods began to appear as did the fly reel and vastly improved fly lines these advance would in time lead to a change in how the floating fly was fished and for that matter how all fly types would be fished. In 1800 George Scotcher published Fly Fisher's Legacy in which he stated that *"The fly that floats, and kills fish because it floats". As time follows the next major contribution came from Alfred Ronalds who published The Fly Fisher's Entomology in 1839. Ronalds' work was landmark because it was the first study of the insects that the trout feed on that was conducted by fly fisher. The work was to impact fly fishing far beyond its publication date and with a careful study of the text you will find that Ronalds' advocated fishing some flies on the top of the water. Now let us skip forward to next publication which began the rise of the dry and that was authored by George Philip Rigney Pulman and was entitled The Vade Mecum of Fly Fishing for Trout and first published in 1841, in that edition Pulman stated **"He notices that the Ephemeridae sit upon the water, and that trout station themselves just below the surface and gently lift their noses as the flies sail over." "Now a soaked artificial fly sinks, and thus escapes the notice of the fish who are looking upwards; but if the wet and heavy fly be exchanged for a dry and light one, and passed in artist-like style over the feeding fish, it will, partly from the simple circumstance of its buoyancy, be taken." In 1846 the second edition was published and it was expanded, but the time of this writing I have not been able to obtain a copy to see if his thoughts on the dry fly were also expanded. However I have a copy of the third edition which was published in 1851 and this is what he had to say about the dry fly. "Let a dry fly be substituted for the wet one, then switched a few times through the air to throw off its superabundant moisture, a judicious cast made just above the rising fish, and the fly allowed float towards and over them, and the chances are ten to one that it will be seized as readily as a living insect." With that statement Pulman set the course of the dry fly on a path that was soon to change the world of fly fishing. *Quote taken from History of Fly Fishing for Trout, Published by John Waller Hills, 1921 **as was the Quote from the 1841 edition of Vade Mecum, by G.P. R. Pulman. Now I must report that Pulman made no claims of inventing the dry fly, nor did he take credit for stated false casting of the fly he was merely reporting on a method that had been in practice for a period of time. The tackle had finally caught up with the modern desire of the angler to fish the dry. Now some anglers of the time choose not to fish with a dry fly and some choose to work both styles. Ever since the time of Charles Cotton most anglers choose their casting angling based on the wind, Cotton himself offered that the angler should fish with the wind at the back whenever possible. The advice was followed by anglers and authors down through the centuries and was reinforced by each telling until the school of downstream angling became tradition. The anglers who advocated casting upstream were ignored or consigned to a special situation and therefore not part of the mainstream of fly fishing. I also believe that is why many believe that dry or floating flies were not fished during the 15th, 16th, 17th or 18th centuries. I believe that intellectual decisions were based on the angle of the cast and the perceived tying styles of the imitations and many of these decisions were in fact faulty. In 1857 William C. Stewart published The Practical Angler, this volume unlike some publications of the day was widely read and was to impact the theory of the dry fly that was put forth by Frederic M. Halford. In his volume Stewart offers a couple of observations which were not new, but with his style of writing, his words were to reverberate down through the years. "The attempt to capture trout which are seen to rise at natural flies is in itself an excitement which no other method possesses." "The great error of fly fishing, as usually practiced, and recommended to be practiced by books, is that the angler fishes downstream, whereas he should fish up." If you study the text of Stewart and pay attention to his patterns you soon will realize that Stewart was fishing his soft hackles Spiders on the surface film, in the surface film and beneath the surface film. 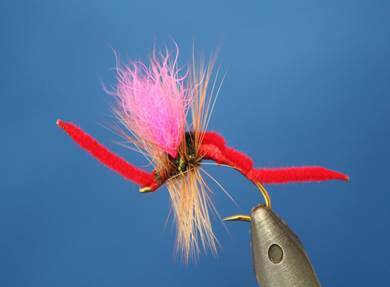 This point was brought up by Roger Fogg in his 2009 publication Wet-Fly Tying and Fishing. However the person who was most influenced by the writings of Stewart was Frederic M. Halford and the upstream theory of fishing would be presented in his works. Now in the preface of Floating Flies and How to Dress Them, published in 1886 and interesting statement, "About the period I took counsel of a friend, who acquaintance I had made some short time previously, and who, in addition to being one of the best, if not the best dry-fly fisherman in England". This statement alone shows that dry-fly fishing was not unknown in England and the preface does give us a window into the Chalk Stream anglers of the south and the North Country anglers who fished other methods and styles. Halford also stated that the angler should cast upstream to a rising trout and that the angler should false cast away the excess moisture to keep the imitation dry and floating on the surface. Now Halford different begin his studies or his book with the tactics of fishing the dry fly, began with the patterns used to imitate the natural insects he seen on the water. I believe he realized that this area had not been handled in a manner that was conducive to the art of the dry fly. Halford gave the angling public a chance to do what they had always wanted to do and that was to have the patterns which would consistently float on the surface. Angler for centuries had been observing this act and now they had patterns and a method that would consistently produce. Halford would codify the theories of the dry fly in 1889 with the publication of Dry-Fly Fishing, In Theory and Practice. The allure of the dry fly was heady and effective and soon a cult-like following emerged and was especially strong on the chalk streams of the south and like and cult they tried to make their way of fly fishing to be the only method of fly fishing that was ethical and sporting. The coming of the dry fly was meeting of right style of imitations and the proper advances in tackle along with a group of individual to were totally consumed with the art of the dry fly. There is no doubt that Halford's contributions to the art of fly fishing were beyond measure and every angler who casts a dry fly on the water to a rising trout owes something to the effort of Frederic M. Halford. The doctrine developed by Halford and his follower was pushed to extremes and would lead to difficulties that could have been avoided. Later some authors would write histories claiming that dry fly fishing was invented during a certain time and in a certain country. When the truth is that the saga of the floating flies goes back centuries and every angler who swapped out his wet imitation for a dry one and every tackle maker who developed a new rod or line also contributed to the development of the dry fly. Look at the contributions of Henry S. Hall who in collaboration with George Selwyn Marryat and Frederic M. Halford developed the eyed fly hook and W. G. Turle who developed the knot which allow the eyed hook to be attached to the gut tippets of the day. Prior to 1889 most of the hooks made for fly tying were blind eyes hook types and after the eyed hook was developed it wasn't just universally excepted as a matter of fact the salmon fly anglers wanted nothing to do with these new hook and as late 1930 blind eye hooks were still being made. The point is that everything progresses in an orderly manner based on the technology development of the tackle to coincide with the observations and theories of the anglers of the day. There is no doubt that the theories of the dry fly will continue to reverberate down through the pages of fly fishing literature because it was what drew the first angler to the water seeing the trout rise up and take the insect off of the surface of the water. The eyed hook was to change the entire world of fly tying as with a short period of years all imitations would be tied on them. Due to the popularity of the dry fly people allowed themselves to feel that their way was the only sporting way and this in fact retarded the progression of other aspects of fly fishing. They forgot or never considered the fact fly fishing is an individual sport and each angler should have the right to follow his or her own path to fly fishing contentment. Now, in closing, I would like to add that historians who track the path of history must remember the times and places where various works were published and tie in the availability of the works and the historical times in which it took place. Today we have the luxury of large libraries to research and the advantage of the internet which allow us to obtain documents and view texts which would other wises be denied to us. With all of this information we have a responsibility to base conclusions on fact and to do so with intelligence and careful consideration.